It comes with little shock or surprise... inevitable really, sooner or later they were going to show up in the Canadian stretch of the Red River. In fact, I think they were "officially" found in 2013, or at least their larvae were. 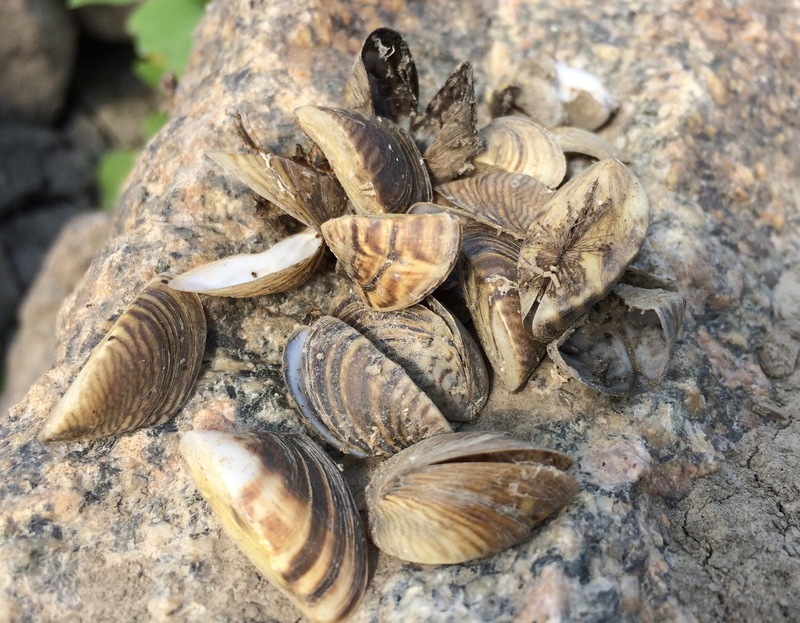 Zebra mussels have been all over the local news through the last few years, though they have been in North America since at least the mid 80's. They are an invasive mussel that poses a major threat to aquatic ecosystems and infrastructure and they are slowly taking hold in a few bodies of water in Manitoba. 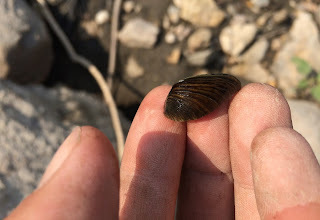 This summer some popular beaches along Lake Winnipeg have had masses of these mussels wash to shore after big wind events and recently I came across a few dozen along the Red River. 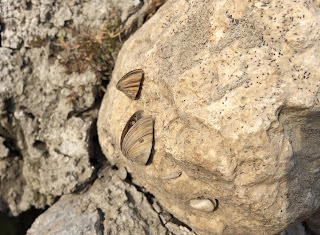 We were shore fishing a stretch of the southern Red River the other day when I noticed a two centimeter mussel attached to a rock. After closer inspection there were a few more of varying sizes. 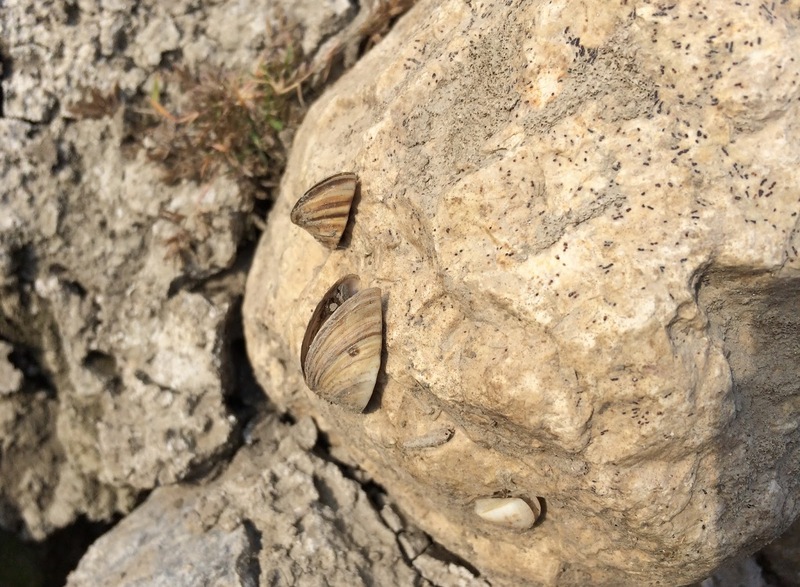 None of our native mussels or clams are able to attach themselves to rocks and I immediately knew what they were. 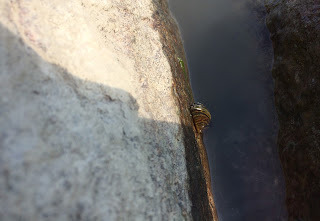 The river is more than a few feet down from its average level and with the bite slow at our location I began to scour the rocks in the area. I quickly found more Zebra Mussel shells, each one was dried out and the sizes varied. 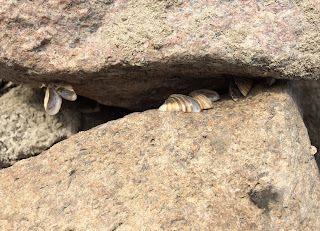 This rocky stretch of the river appeared to have a small population of adult zebra mussels and I dreaded to think how many more could be on the rocks beneath the water. In the end we did find a few different species of fish willing to bite our baits, channel catfish, goldeye and freshwater drum were all landed however none were really picture worthy.